Authors: Alexander Osterwalder, Yves Pigneur, Gregory Bernarda and Alan Smith. 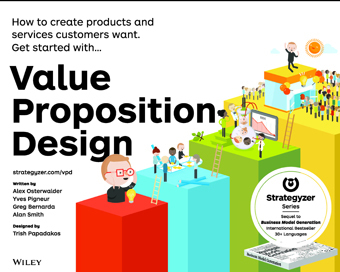 Value Proposition Design is for anyone who has been frustrated by business meetings based on endless conversations, hunches and intuitions, expensive new product launches that blew up, or simply disappointed by the failure of a good idea. The book will help you understand the patterns of great value propositions, get closer to customers, and avoid wasting time with ideas that won’t work. You’ll learn the simple but comprehensive process of designing and testing value propositions, taking the guesswork out of creating products and services that perfectly match customers’ needs and desires.